When Bartholomew Bouge (Peter Sarsgaard) threatens to throw out all the inhabitants from a small town in the old west because of its rich land, the recently widowed Emma Cullen (Haley Bennett) sets out to enlist men to help them protect the village, and that's when Sam Chislom (Denzel Washington) puts together a group of seven renegade gun men to help the villagers defend their land. 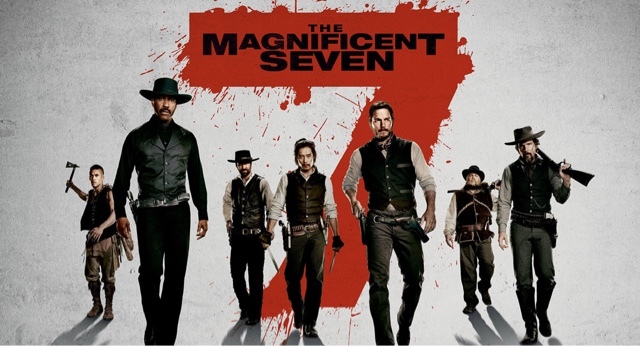 Having never seen The Magnificent Seven from 1960 I cannot comment on anything regarding the update this version does and how it lives up to that, nor do I care to do so or to compare it to its old originator The Seven Samurai. On its own, 2016's The Magnificent Seven stands as a well-packaged action film with, sadly, zero depth to spare. Nothing can be taken away from the very solid production that is put into place. The sets are as beautiful as we could expect from a western. The cast put into place is impressive and puts on a show that is worthy of their talent. Of course Washington shows again how he has a kind of charisma that will be found in one out of a million actors, almost literally. He doesn't need to do anything, we as viewers are simply carried away with him, and he always has a way of showing that something deeper is going on with his character. The cinematography, as with everything else, is technically impeccable. The sweeping shots are beautiful, it makes the most out of its setting and gives us some great sunset and night sequences and images and even better battles with impressive practical special effects. There also are many, and I mean, many tributes to past classics: there is almost an overuse of the Sergio Leone stare off. All of the above is pretty much world class production, but that is all on the surface level. Once one starts uncovering what is going on below he would unfortunately not find much. The characters are almost all empty shells. After Jurassic World and then this I feel sorry that Chris Pratt isn't given material to shine and instead is being typecast and used in these cliched, empty roles that have no consistency in it of themselves. He is relegated to one liners and cool stares and lives with a character that hasn't anything else going on. Unfortunately, almost none of the other cast members are given much more. Washington and Bennett are the only ones that slightly manage to stick out. The film is completely void of any emotion and filled relentlessly with genre cliches, some of which aren't even treated well and fail even in their most elementary job. There is no depth sensed anywhere and it makes for a very heavy viewing experience that, clocking in at two hours and twelve minutes, proved to overstay a little too much its welcome. The editing is also very jarring and doesn't give any clarity to any of the complex sequences the film has. It is all over the place from the opening scene which is incredibly disorientating right to the final battle sequence, which has no sense of geography, goes on for half an hour and ends up being a montage of people shooting and people falling from horses for the majority of its duration. Fuqua is a director I deeply respect for his proficient and always technically impeccable work, but here that is all I was given which made for a tiring and almost annoying experience.